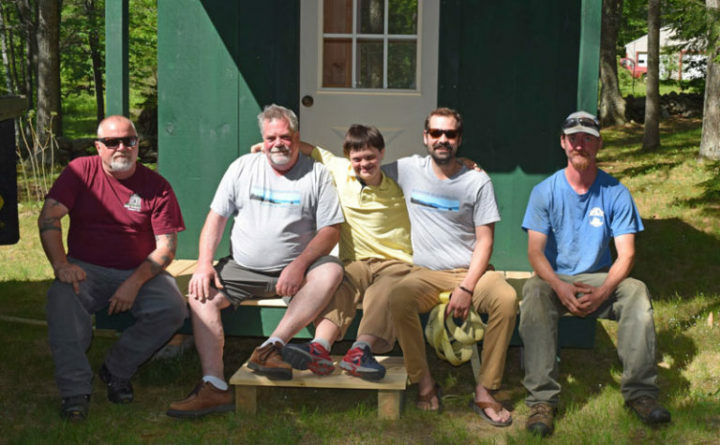 From left: Matt Dorsey, Matthew Jones, John Rankin, Caleb Jones and Chris Richards sit on the porch of John’s new house in Wiscasset. The group delivered the tiny house June 3. John Rankin of Wiscasset is a ninth-grader attending Boothbay Region High School, and has Down syndrome. On June 3, he finally received what he has wanted for years — his own space. John followed the daily rituals people do when they have their own place. After exiting his room, which he referred to as his apartment, he would cautiously pretend to lock his door with a key. He would keep his space private, telling his family, “’Don’t go into my apartment,’” DiPrima-Rankin said. She knew she wanted to find a space for her son a few months ago. John and his cousins had been watching “Andi Mac,” a Disney Channel comedy-drama about a preteen who owns a shed next to her parents’ house, where she makes arts and crafts. John came home saying, “I want an Andi Shack,” DiPrima-Rankin said. He usually does not want much, only some markers and other small things, DiPrima-Rankin said, so she decided to find John his own, personal Andi Shack. She asked Matthew Jones of Edgecomb, her ex-husband and a master builder at Baywood Builders, if he could install windows into a shed she wanted to buy for John. Jones, who has volunteered with autistic children and children with brain injuries in Fitchburg, Massachusetts, thought about the idea. He decided to go in a different direction, using leftover and new material to build a tiny house. Five weeks later, the house was complete. On the morning of June 3, John was surprised with a hunter-green house as Jones backed up his truck, house in tow, in DiPrima-Rankin’s front yard. Matt Dorsey, owner of M&R Dorsey Builders, brought his boom truck to lift the house from Jones’ truck, while family friends assisted by placing cement blocks on the ground to elevate the house. To complete the look, “John Rankin” was engraved above the house’s door and a small wooden step was placed in front of the house’s porch. John ran in and immediately laid down on the hard, pine floor. “My life won’t be the same,” he said twice. Now, John Rankin is brainstorming ideas for his new house. He wants to grow a garden, get a cat and host a barbecue party for the Fourth of July. He also hopes to do some of his favorite activities in the house, including singing and writing lyrics, dancing, and playing guitar and piano with his brothers, Zach Rankin and Caleb Jones, who are also musicians. The house has electrical wiring, which made it possible to have inside and outside light fixtures and a few inside outlets. “Our philosophy has always been: if he wants to ride a bike, let him ride the bike; if he wants to play soccer, let him play soccer,” said Michael Rankin, John’s father. Just like these other activities, John Rankin’s tiny house is giving him a chance to control part of his life, DiPrima-Rankin said. Now, instead of pretending to lock his room, John will have to physically lock his new house.